If your tooth hurts when you wake up, it is time to try a night guard. Give a night guard a chance and you will likely wake up with less oral pain or no pain at all. If you are hesitant to place a night guard in your mouth while resting, don’t fret! This oral health device is much more comfortable than most initially assume. You are likely wondering why your tooth hurts so much when you wake. The answer to this question differs by patient yet it is often attributed to teeth grinding during sleep. This grinding has the potential to cause significant damage if it is allowed to occur for months or years. If your tooth hurts when you wake, you might find it difficult to enjoy your breakfast or even brush your teeth. The damage can reach the point where the teeth become flat and highly prone to breakage. Some patients who wake with tooth pain clench their teeth while sleeping. Certain patients grind or clench their teeth as a result of stress. Others clench and/or grind their teeth at night as they dream. In some cases, alterations in temperature throughout the night cause such clenching and grinding. Most patients find a night guard is an optimal solution to waking with sore teeth. A night guard minimizes or even completely eliminates the potential damage caused by teeth clenching and grinding during the night. This guard stops teeth from contacting one another during the night. It does not matter if the patient continues to grind or clench his or her teeth during the night. There is no such negative result when the night guard is in place. This guard is worn over the top and bottom rows of teeth. Such a guard even has the potential to correct a patient’s bite to ensure those muscles in the mouth stay nice and loose during sleep. Night guards are typically made of soft plastic, hard acrylic or dual laminate. Hard acrylic is generally favored as it proves more durable than the other options. Those who suffer from extensive teeth grinding will find a hard acrylic guard makes a meaningful difference in tooth pain. Custom night guards are made according to a dental impression of each patient’s unique teeth. 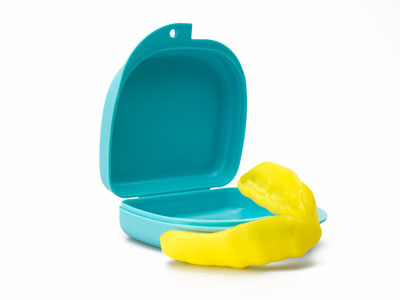 This is a stark contrast to the dental night guards you can purchase in a grocery or drug store. A custom-designed mouth guard can be applied and removed with ease. If your tooth hurts when you wake, meet with your dentist to determine the extent of the damage, if you have jaw alignment problems, TMJ or another oral health problem. Your dentist might recommend a special style of nighttime mouth guard designed with ramps, metal clasps or other nuances. Perhaps your dentist will explain your tooth hurts upon waking for a reason beyond those suggested above. This oral health expert will study your teeth to pinpoint damage, fracture lines or other issues and have the perfect night guard designed for your idiosyncratic mouth. Call (281) 477-7200 to schedule an appointment with Pearl Shine Dental in our Houston dental office.